I have been intending to read C.L Taylor’s books for the longest time. I don’t know why I haven’t yet, but I will soon be rectifying that after reading her fantastic YA debut! 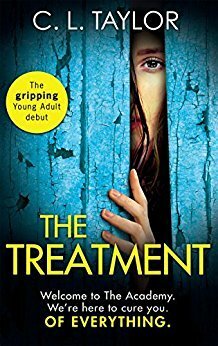 I was utterly gripped by The Treatment and finished it within a day. The Treatment centres around sixteen year old Drew Finch. Her younger brother, Mason, is expelled from school and sent to a residential reform academy in Northumberland. It is from then that the problems really occur. Drew is followed by Doctor Cobey with a message from Mason. Mason tells Drew that he’s worried about the ‘treatment’ that’s going on at the reform academy. He needs her help. After some googling and finding a former resident, Drew needs to get into the school to discover exactly what’s going on for herself before it’s too late. I thought this book was utterly gripping. Right from the start it had me intrigued and didn’t let go of me until the last page. The story is really easy to read. It has some interesting characters, ones you hate and ones you root for. I loved to hate some of the characters in this story. There really is a great range of well written characters. The pace was fast and short chapters really helped this. I really enjoy psychology reads and I loved how C.L Taylor used psychology in the story without it becoming too bogged down. It was incredibly clever and engaging. I’m not the desired age for this book, but I absolutely lapped it up and I’m pretty confident that this book would appeal to adults as well. I will definitely be reading C.L Taylor’s adult thrillers after thoroughly enjoying this book!